for the Secret Gardens of Rolandswerth"
Seeing a garden as a rhetorical landscape, which is crafted, as a nature-like shaped figurative or textual fragment, as a three-dimensional model of thinking, a picture to step into. And of course as a place for social interaction. Within the framework of the long-term project "Sculpture Garden Remagen" run by The Arp Museum Bahnhof Rolandseck we have decided to turn the Hentzen Park at Rolandswerth into a projection surface for a programmatic claim. Citing from the "Allgemeine Brouillon" written in 1798 by Novalis: "The accomplished speculation leads back to nature", we turn to an aphorism which assigns the park importance as a thought model, besides its many layers of historic importance. The sentence is being devided into three parts: The first part being "The accomplished speculation" is put up in big letters at the new main entrance, and with these words invites to visit the park. 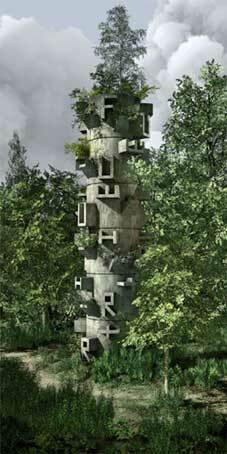 The second part, "leads", is incorporated into a tower made of plants. Finally the third part, "back to nature", is written backwards on the backward exit of the park, which also has been reconstructed. In order to be able to read and understand the sentence it is important that the visitor follows the given route. The way leads from the main entrance towards the tower, around it, back, heading towards the Rhine, down some steps onto an old towpath then back towards the greenhouse, which now functions as a museum. The 120 years of the parks history is being expressed in documentary form as well as through language. This project offers the possibility to give life to our exemplary concept of what a picture is and to continue the interplay between place and picture.